Looking to select a new translator? Buying translation can be frustrating. How do you know the good translators from the bad? This 80 page E-book will guide you through the process to make the right decision. 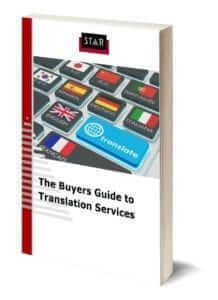 It details common terms, pitfalls and solutions to successful translation projects. Subscribe to our mailing list and get your complimentary E-book now. Why we ask for your information? *By supplying your information you agree for STAR to contact you with further information about our services. We only send you occasional mails and we comply with GDPR regulations protecting your privacy.